As my pregnancy came to its last weeks, freezer meals were on top of my mind in preparation for this baby! But with an always-packed freezer, I have to be conscious of how much space things take. 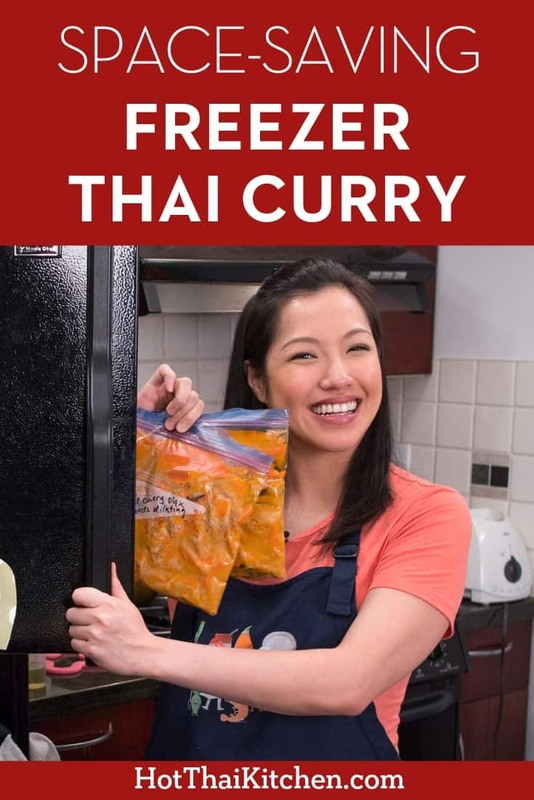 Here’s how I make Thai curries for the freezer that will reheat well AND will not take up unnecessary space. This video isn’t so much as recipe, but more of a tips and tricks video. 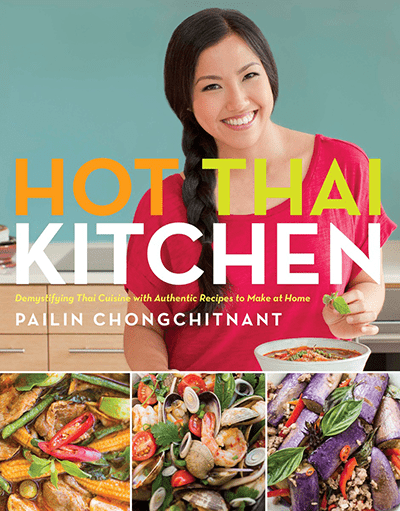 You can apply this method to any of my coconut-based Thai curry recipes. And now you will have a meal that’s ready to be served in just a few minutes! Concentrate the sauce. When making a freezer curry I reduce the amount of sauce down to only what’s necessary to cook the meat. Then I simply add more water when I reheat it! If you’re working with a recipe that calls for stock or water in addition to coconut milk, be sure to omit it and and add it when you reheat. 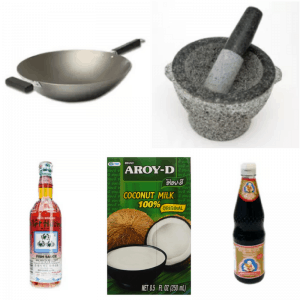 You will still reduce the coconut milk as shown in the video. Use overcook-resistant meats. Because you need to reheat the curry, the chances of you overcooking the meat is high. So don’t freeze protein that is not something you want to eat if it’s overcooked. For example, I really dislike overcooked chicken breast, so I opt for thighs instead. Apart from chicken, any stewed and braised meats are perfect as they are essentially overcooked-proof. Consider adding vegetables when you reheat. If you are particular about veggie texture, please note that thawed vegetables will be completely soft, so if you like that “al dente” or firm vegetables, I recommend adding them at the end when you reheat. Most veggies only take a couple of minutes to cook anyway, and this way you save even more space! If freezing veggies, choose them wisely. Of course you CAN add in veggies if you want to make it a microwave-ready meal. Here’s the rule of thumb: Choose vegetables with low water content. Water turns into ice crystals in the freezer, and those ice crystals are sharp and they puncture the cells of the vegetables causing them to be soft when thawed (which is why thawed berries “bleed” out their juices). Broccoli, cauliflower, potato, bell peppers, peas are some vegetables that will be intact when thawed. Bamboo shoots in particular will come out almost exactly the way it went in! If possible, add delicate herbs when reheating. Delicate herbs such as Thai basil will look and taste much better if you add them at the end. This is not to say that you cannot freeze the curry with Thai basil, but just so you are aware that the Thai basil will be dark and mushy when thawed. Bonus content for Patreon members: For this episode I share what other foods I regularly freeze which makes my cooking much easier. Click here to learn more about becoming a Patreon member! Reduce ¾ cup coconut milk in a pot until thick, then add curry paste and saute with the coconut milk for a few minutes until coconut oil separates from the paste, or until the paste is very thick. Add the remaining coconut milk , 1 Tbsp fish sauce and 1 Tbsp palm sugar, and simmer for 7-10 mins to reduce liquid volume by about half. Note: I keep the seasoning on the light side for now so I have room to adjust when I reheat and add fresh veggies to it. Add chicken (or whatever meat you’re using) and kaffir lime leaves, if using, and cook another 15-20 mins until chicken is fork tender. If using another meat, adjust cooking time accordingly. I stop and freeze the curry at this point, and I will add vegetables, fresh herbs, and more water/stock when I reheat. But if you want, you can add in some vegetables now (see note above). Put the curry into freezer bags, dividing it into portions that you will most likely eat at a time. So for me, I divide it into 2 servings per bag. Removing as much air from it as you can before closing, and place in a large bowl of cold water to cool it down quickly. Once cool, dry and label the bags, you might also indicate that it’s concentrated and needs diluting in case you forget! Lay the bags flat to freeze, pressing it down so it has even thickness. This will make is fast to thaw. Slide the curry out into the pot. Cook over medium heat until everything is melted. Bring to a simmer then add whatever vegetables you want and cook till they’re done. Stir in any fresh herbs, such as Thai basil. Place the curry bags in a bowl of hot tap water just until it can slide out. Break the curry into chunks and add to a microwave-safe bowl. Add only half of the water or stock called for, then microwave until hot, stirring a few times in between. Stir in fresh herbs at the end if desired. Taste and adjust seasoning, adding more of the remaining water/stock as needed to adjust consistency and flavour.